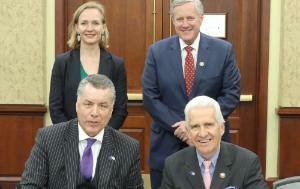 Welcome to the pages of the European Parliament's Delegation for relations with the United States of America (D-US). As Chair of this 58-member strong delegation, I have the honour of presiding over our regular meetings in Brussels and Strasbourg, many of which are webstreamed live and can be followed on this website. I also have the privilege of co-chairing the inter-parliamentary meetings (IPMs) we hold twice a year with colleagues from the House of Representatives of the United States Congress. Our latest meeting from 26-28 February 2019 was the 83rd EU-US IPM, which demonstrates the deep and long-standing nature of the ties between EU and US parliamentarians. During these joint meetings, our debates focus on specific areas of common competence of our two legislatures and on practical ways of enhancing our cooperation further. Both the US and the EU currently face a wide range of pressing individual and collective challenges. In this uncertain context, the relationship between our two bodies has become more important than ever. I am convinced that our personal ties, our interlinked economies, our shared history and our common values are the ingredients that will continue to make the transatlantic relationship so enduring. Click here for a 2-minute video on relations between the European Parliament and the United States Congress, from the website of the European Parliament Liaison Office in Washington, DC.